The 2018 election season is already shaping up to be a momentous one for Florida’s public schools. The governor’s office and cabinet positions will be on the ballot along with other seats including the U.S. Senate, House and a slew of State House and Senate races. 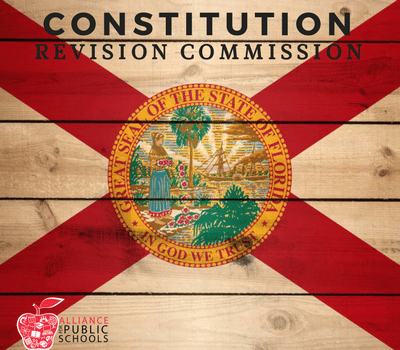 Every 20 years the Constitution Revision Commission meets and proposes amendments to the Florida Constitution. Their amendments will appear on the already lengthy 2018 ballot. The outcome of this election will potentially change the future of school funding, vouchers, charter schools and more. A new survey from Florida TaxWatch found 77 percent of Florida voters said they haven’t heard about recent Constitution Revision Commission meetings. Another 13 percent of respondents, according to the survey, said they only saw, read or heard “a little” about the commission’s activities. Members of the Commission were appointed by Governor Scott and other state leaders and serve at their pleasure. These members have the sole power to determine what issues make it on the ballot yet, most Floridians have never heard of them. In spite of their power, the voters will have the final say in what becomes the law of the land. Voter turnout will be less in a non-presidential year, and candidates for governor and Cabinet seats can capitalize on various amendments – for or against them – in their campaigns. But it might be tactically safer for them to avoid the referendum issues, rather than alienating voters on either side. In any event, people tend to vote against anything they’re not sure of – if they vote at all, down at the end of a long ballot. The Florida voter has the power to decide the future of the state. Tell your elected officials and Governor Scott that students and their public schools are important to you. One click and you can send a message to politicians that kids and their schools must be a priority when they return to Tallahassee this fall. Please donate today. Your generous gifts help support the Alliance’s policy analysis and online tools so more people can easily connect to elected officials and support public education.